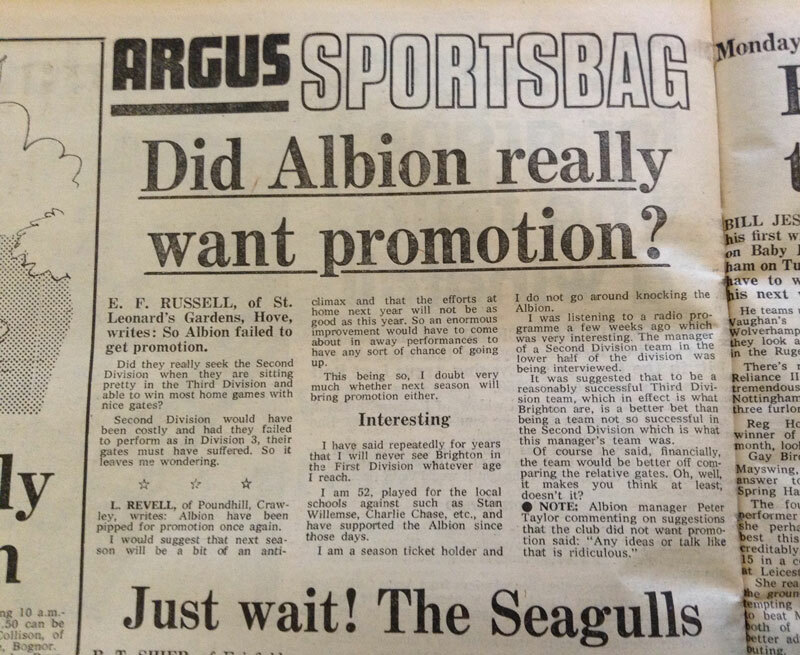 Did Albion really want promotion in 1976? Some angry and sceptical letters from E.F. Russell and L. Revell in the Argus in April 1976, as Brighton’s promotion push in Division Three peters out with one win in their last eight matches, despite rookie striker Peter Ward hitting six goals in that period. In the end, Albion were tonked 3-1 at the Den. Happily, Revell’s pessimism was misplaced. In fact, 1976/77 went down as one of the most golden, most celebrated seasons in Albion history, signalling the start of the glory years. As formidable a home record as Brighton had in 1975/76 (W18 D3 L2), they improved their Goldstone record the following campaign (W19 D3 L1). In 1976/77, they also significantly enhanced that wretched away record, from W4 D6 L13 to W6 D8 L9. However, it was to take all the motivational drive of Alan Mullery, and the deposing of top scorer Fred Binney (who got a mere five away League goals in 1975/76), to bring this to fruition. Peter Taylor had long departed, but he did also achieve promotion in 1976/77, with Brian Clough, of course, as Nottingham Forest sneaked back into Division One. Glory was just around the corner for them too.